Figure 6 of Querques, Mol Vis 2009; 15:2960-2972. Figure 6. Color fundus photographs and spectral domain optical coherence tomography scans of patient CT02 and patient CT04. 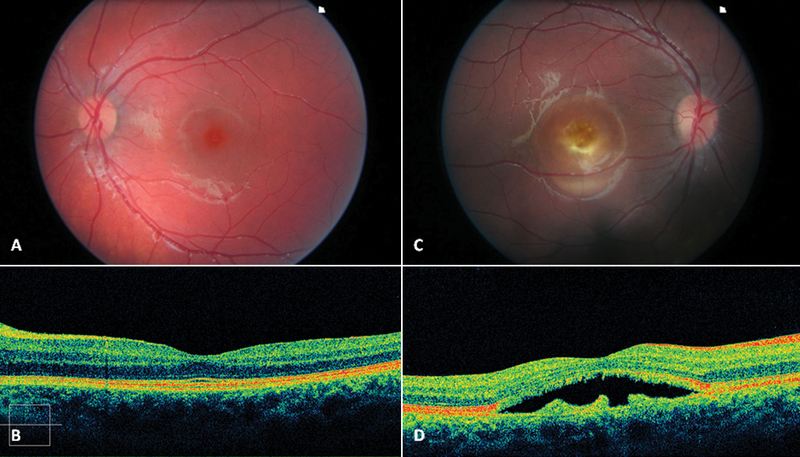 A normal fovea and a vitelliruptive macular lesion are shown on color fundus photographs of patient CT02 (A) and patient CT04 (B), respectively. Spectral domain high-definition optical coherence tomography scan shows, in the macular area of patient CT02, a thickening of the layer corresponding to the junction between the retinal pigment epithelium (RPE) and the interface of the inner segment and outer segment of the photoreceptor (C). An optically empty lesion between the RPE and the inner segment /outer segment interface, with clumping of hyper-reflective material on the posterior retinal surface and, on some parts, a hyper-reflective mottling stuck on the RPE layer (D), appears on the macular scan of patient CT04.